Select a size Standard 2.5 - 3" Obese 3.5+" Petite 1.5 - 2"
For the woman who loves a lil' sophisticated FUNK! 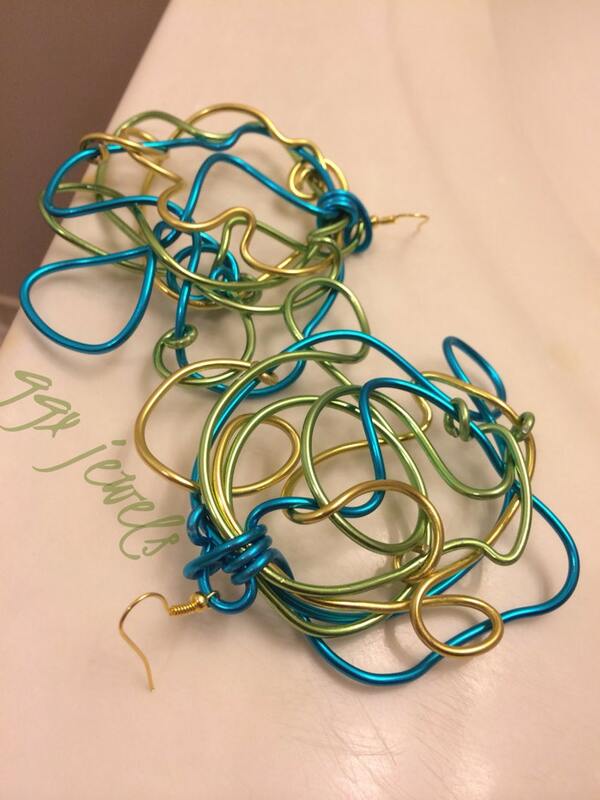 This listing is for one wildly abstract pair of wire earrings in your choice of up to 3 colors. Made out of anodized aluminum wire - hypo allergenic, non tarnish, & lightweight. Many color combo's available to suit your accessory coordinating needs. PLEASE MESSAGE ME YOUR COLOR CHOICES upon ordering. Each pair is made to order, and processing & shipping time is approximately 5 business days - depending on how many orders are in the queue. If you require special Rush Order service, please let me know. Please note that due to the abstract nature of my wirework, your items may not be identical to what is shown, but will be as close to the sample image as possible. That's the beauty of wearable art!